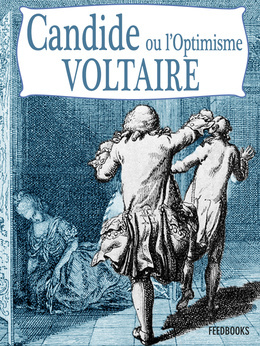 Candide is a philosophical story set around the world in 18th century. It depicted a young man who lived in a paradise-like country of Westphalia. He was brought up by a Baron, and fell in love with the Baron’s daughter, the fair Cunégonde. Candide was educated by a philosopher called Pangloss. Pangloss believed that all in the world is created for the best, so even if there are evil and catatstrophe, they are meant to lead mankind to something better at the end. With this philosophy stick on his brain, Candide took his journey around the world after being kicked out by the Baron for seducing Cunégonde. Having been experiencing real life, the innocent Candide was confronted with so many unfortunate events, evil, corrupt men, greed, and deception. All those times he was bewildered at the evils and injustices, and started questioning whether Pangloss had taught him wrong. Candide even held to his believe in “pure nature is good” principle, although he had just escaped of being eaten by the Oreillons, thanks to Pangloss’ principle. As a novella, Candide is very uniquely written by Voltaire. 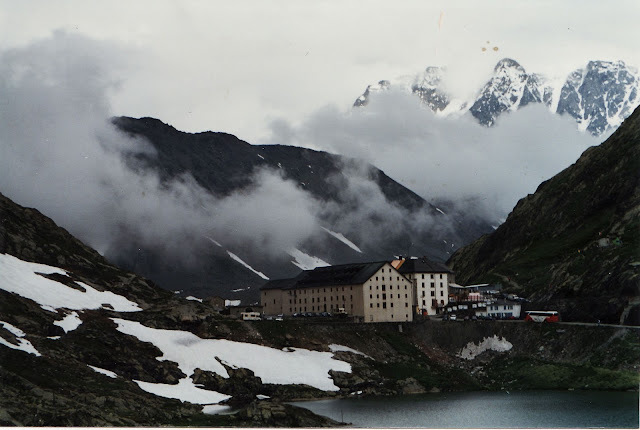 If you have ever read Baudolino by Umberto Eco, you will see a style similarity with Candide. Both Candide and Baudolino involved in not only one historical event, but hopping to many of them through some comical and absurd incidents. Like Baudolino, Candide also sailed to many countries, met historical important persons, and presented with many cultures and religions during his journey to unite with Cunégonde. But only at El Dorado that Candide found only happiness and beauty. He was even be made richer than any Kings on earth because all soil and pebbles in El Dorado were made from gold and other precious stones (for outsider) but were treated as just soil and pebbles. I think it is clear that Voltaire wanted to criticize Leibniz’ theory of “all is for the best”. This German philosopher believed that all is for the best because God is perfect, so everything He created must be perfect. I thought about this long after I finished this novella—and am still thinking about it when I am writing this post. My thought is split in two reasoning. In one way I agree with Voltaire that men should not take his life for granted by expecting that at the end everything should turn to good; we must work hard for it. But on the other hand, I agree at some points—at some points only—with Leibniz’ theory too, that God always provides the best for us, He wants to give us only the best, but only if we truly believe in Him and want it. So what is best is, I think, if we do our best, and let God do the rest. In a way Candide (or Voltaire) was right, we must work to gain happiness. But we must also realize that we do not know what is best for ourselves, and in that case, we must trust God that He will give us what is best. And before I end this review, here is one passage that has intrigued me, it’s a discussion between Martin (one of Candide’s philosopher and friend) and Candide, of course at the same topic of the optimistic. Candide was asking Martin whether he believed that men have always done evils. There Voltaire ended the discussion abruptly, but I disagree with Martin. He believed that evil was men’s character, and that was—just like in hawks—their nature; and that the world has been created to ‘plague us to death’. I believe that since God is good and perfect, He created us good, and meant us for the best. However, God grants us the free will—as Candide was about to mention in that discussion—to make the choice ourselves, to be good or evil. Men do have both good and evil in them, but we also have the free will to make choices. I granted three stars for Candide as a story with all the funny comical adventures, and a half star for making me drown to a deep reflection about life. Thank you Voltaire! 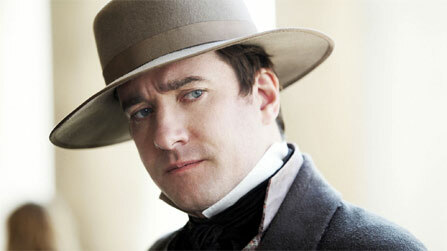 Arthur Clennam is the main male protagonist in Little Dorrit. 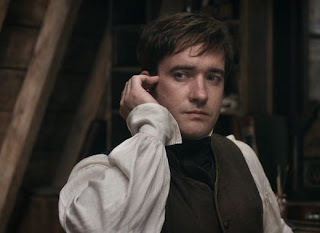 I choose him to be featured in Character Thursday this week instead of Little Dorrit herself, because I found an interesting aspect in his personality. Brought up by the contrast combination of an iron-woman mother and a weak father in a dark and gloomy house full of hatred and revenge atmosphere had affected Arthur’s character as a man. I imagined petit Arthur as an unhappy and brooding child, constantly feeling unsafe and unsure, afraid at every action that his mother would scold him. Fortunately his father took him when he has grown up to China to work as an apprentice in their family business. I imagine, being away from that horrible house and his strict and loveless mother, and lived in a loving surrounding of his father, has altered his personality to be much better. When he returned to England after his father died, Arthur has become a tender and loving person, though his day-dreamer and shyness aspects were still there—which I suspect as the result of his mother oppressive way of bringing him up. What I like from Arthur is his sensitiveness towards injustice. Bringing home a remembrance token from his father to his mother, he insisted to be informed whether their family had been done any injustice to others while doing business in the past; that he would like to repair that if any. Arthur showed that manner too in Dorrit’s imprisonment. He was the originator of Pancks’ investigation in the case, which led to the revealing of Dorrit’s unexpected fortune. What I doesn’t like from Arthur is his over-sensitiveness—or may I say melancholy?—thoughts of himself. After being rejected by Minnie (Pet) Meagles, he considered himself too old for love—and he was only forty!—and although he felt something special towards Amy Dorrit, he pushed aside the idea of love, and assured himself that it was a feeling of protection, or even more a fatherly affection to a child—which led him to call Amy as ‘my child’. Oh Arthur…how foolish you were! All in all, I learn from Arthur Clennam’s story that one’s character was much influenced by how he/she had been brought up. Unhappy characters usually come from unhappy atmosphere in their home. Even if they have experienced much better life conditions after that, small fragments of the unfortunate past might still exist in who they are today. 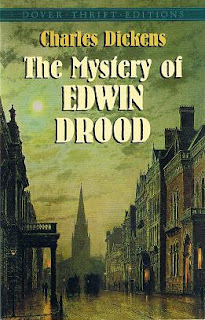 Of all Dickens’ novel I haven’t yet read, The Mystery of Edwin Drood is perhaps one I’ve been looking forward the most. Edwin Drood is the first and the last of Dickens; the first mystery novel he’s ever written, and also the last novel we’d ever read from him. But the most interesting aspect of Edwin Drood is because Dickens was in the middle of writing it when he died. Moreover, on his last days on earth, Dickens’ mood was very dark and gloomy. The Staplehurst train accident that gave him a near-death experience seemed haunted him until he died. Dickens’ health was also getting worse at that time. Those were the circumstances that much affected Dickens when he started writing Edwin Drood. From the beginning the dark and hopeless atmosphere has appeared between the lines. Remarks of death, the cold tombs, and the dark crypt can be found quite often. The dark soul of Jasper—beaten by the power of opium, and his mad love to Rosa—was vividly portrait by Dickens. Shortly, Dickens’ usual melancholy and sense of humor we have been familiar with, faded in this particular work. Edwin Drood was a cheerful and easy going young man. Being an orphan, his uncle Jasper—an opium addict—has been his most close relative and friend. Edwin was betrothed to Rosa Bud—daughter of his late father’s friend—and now it’s time for realizing their marriage. Edwin came to Cloisterham—a cathedral town—but there he was welcomed with a dark atmosphere. There were his uncle who secretly madly in love with his fiancée and acted strangely towards him; there were also orphan temperamental twin of Neville and Helena Landless. One day Neville chaffed him of being indifferent to his fiancée in an offensive manner that ignited a quarrel. Approaching the day of their marriage, Edwin and Rosa met secretly and decided that they were better befriending than being husband and wife. Edwin has been carrying a diamond ring he got from Rosa’s guardian on the day of the meeting, however as the marriage was cancelled, he was about to wait for Mr. Grewgious’ visit to return it. Meanwhile, before he could inform Jasper about the marriage cancellation, he took a stroll with Neville on the night of Christmas Eve. Then he was mysteriously gone. Either he voluntarily disappeared or being murdered, his body was never found. And now, in the middle of the mystery, Dickens died without ever finishing the book, and thus left the mystery unsolved forever. From the beginning it seems that Dickens brought us to take Jasper as the suspect of the crime. We never knew whether Dickens had intended to “kill” Edwin Drood, or made him disappeared. Some critics suggest that as the book title is The Mystery of Edwin Drood, Drood might have not been dead, or otherwise there won’t be any mystery left about him. Makes sense, but anyway, it was quite obvious that Edwin Drood was set to be murdered. By who? And with what motive? Everything concerning Jasper was dark, mysterious and suspicious, and he has a strong motive to kill Edwin. As I am discussing in this interactive post, his big interest in the cathedral crypt and Durdles’ set of keys and their night adventure was very suspicious. He even fainted when Mr. Grewgious told him about the marriage cancellation—shocked from realizing that he had killed his beloved nephew in vain? So I was questioning myself, if Dickens wanted this to be a mystery, surely he would conceal the truth and spread false signs here and there to mislead us. Was that the case here? Was Jasper’s mysterious conducts meant as a distraction to conceal the real crime? Once again, the only one who can answer these never-ending questions could not satisfy us, and left us forever in wonder. And what about the motive? I can figure out two motives at least, of love and of greediness. If love was it, the suspect would be either Jasper or Neville—yes, in mystery we should always think of the most impossible, right? But if it was greediness, how about the diamond ring Edwin had got from Mr. Grewgious? If it was the case, than we could suspect Bazzard, for except Mr. Gewgious and Edwin, he was the only one knew the existing of the ring. Considering that the story—when Dickens left it—was still in the middle stage, anything can happen, and that someone who has been previously behind the curtain could turn out to be someone with important role. Well, we can go on and on with our analysis, but all would be in vain because we would never know the truth. I guess, even Dickens have not known where this story would end when he died, as he never created a fixed plot before writing this particular story. I read elsewhere that Dickens just wrote the story and thought about the details in progress. Finally, I can only say that although this won’t be my most favorite of Dickens’; I still felt his personal emotions involved in the story, as if I could feel his despair, his struggles, his agony, and his fear of death—or should I say the intuition that death was approaching?—in most of the lines in this unfinished book. The Mystery of Edwin Drood, I think, is one of the most precious legacies Charles Dickens has left us. Four and a half stars I grant for this book. Let’s Discuss On The Mystery of Edwin Drood! Everyone is invited here, whether or not you are participating in Celebrating Dickens. We will have the discussion via comment box. I will start one or two topics, then you can post your own idea, response or theory upon it by replying the comment. If you want to discuss something apart from my topic, you can start it by posting a new comment. 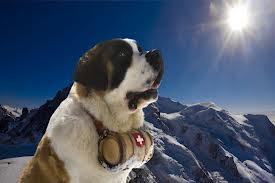 It will be better if you give title to your comments to help others get to the subject easier. To follow the discussions, you can “subscribe by mail” all comments in this post (just click the link below the comment box). There have been a lot of theories on this from Dickens’ critics, but I invite you to have your own imagery of the story. Until now, Little Dorrit might have been the most struggling Dickens I have ever read. If you think it’s the thickness, no, it’s not a problem at all. It’s not the story either—although I did have several complaints I would have made to Dickens on it if he’s still alive. The most annoying aspect in this book for me is Dickens’ lengthy depiction around Circumlocution Office and the economics system, which reminds us of the infamous Ponzi scheme. I know, it’s mainly on those two subjects that Dickens wanted to criticize through Little Dorrit, but again, his tedious description and emphasize on those subjects really bored me to death. Little Dorrit followed the story of the Dorrits in their two extreme conditions. 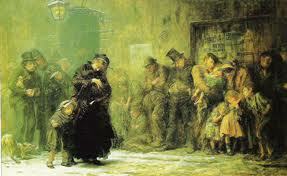 In the first stint, they lived poorly in Marshalsea debt prison—Dickens wrote it from his own childhood experience. Amy Dorrit born and grew in this prison, and after her mother died, she must endure not only poverty, but most of all—especially for Mr. Dorrit the father—family’s humility. In this prison also, Amy befriended a young man, Arthur Clennam, whose kindness and attentive manner has stolen her heart. In the second stint, the Dorrits unexpectedly inherited a large sum of money, which altered their faith. Leaving the prison behind, they hastily entered the high society of London. Beyond that, Dickens also took us to the chronicles of the Clennams, the Merdles, the Meagleses, the Gowans, Rigaud and Cavalletto, and of course the mysterious Miss Wade. 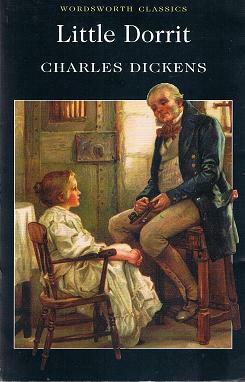 Their stories intertwined with each others, and through them Dickens presented us with the dark themes of social injustice, hypocrisy, greedy, hatred and revenge; and showed us how love and kindness were the only way to happiness. My first impression after finishing this book was how Mrs. Clennam reminded me of Miss Havisham, both with their eternal passion of vengeance against love infidelity, and both rotted in their darkness houses and hearts. And then I was thinking how vividly Dickens wrote about their hatreds, did he experience the same feeling himself? In the same likeness, Little Dorrit also reminds me of Little Nell in The Old Curiosity Shop. Both were tender, shy, grew in poverty—which forced them to bear a bigger responsibility than what girls at their age must bear. Both were full of love, and must take care of the elders, and both were called ‘Little’. I think this was much influenced by Dickens’ fondness of young, delicate and innocent girls. From the plot I felt that, here and there, Dickens seemed to force things to suit each other. At first the story was quite boring, again, with long description of the Circumlocution Office—the satiric way Dickens criticized the unbearable bureaucracy; that even they seemed to always be busy, they in fact did not do anything but circling one task all over the office without ever gone out from it. Fortunately nearly the end, we were entertained with the mysteries surrounded the Clennams, which boost the plot a bit faster, although I felt it too faster this time. There were still few things I still didn’t get after finishing it. First of all, what did really happen with the money Little Dorrit should inherit? Was the money still existed when Mrs. Clennam revealed the secret? Was it kept in Mrs. Clennam’s possession all the time? Or whether Mrs. Clennam had spent the money? But on what? Considering on how wretched her old house was, the fact that she could not afford to buy back the codicil from Rigaud/Blandois, and her high pride, it’s very unlikely that she did as low as using the money herself. And speaking about the house, don’t you think its ruining or blazing was a bit exaggerating? And, who was the “the poor thing that kept here secretly”, whose ghost haunted the house and whose “sounds” Affery used to hear? And what about the oddness of how Mr. Gilbert Clennam—uncle of Mrs. Clennam’s husband—had made his will. After the woman with whom Arthur’s father had had adultery died, the money must be granted to her patron’s youngest daughter or the youngest daughter of the patron’s brother if the patron didn’t have any. Wasn’t the plot a bit forced, do you think? Why her patron? And most of all, why the youngest daughter? Well, it is supposed to be a tale anyway, but still…. I keep also wondering why Little Dorrit insisted upon burning the codicil. I think Arthur had the right to know who his mother was. Mrs. Clennam has died anyway, so Little Dorrit won’t hurt anyone—but Arthur—if she just let Arthur read the document. And I don’t think Arthur would have been much hurt by the secret, he might have been angry to Mrs. Clennam for deceiving him, but still...I would never agree on one’s hiding a truth from someone he/she loves. Or perhaps Little Dorrit was afraid that the legacy will make her rich and unhappy? But the one she burned was only the codicil, not the original legacy, isn’t it? Oh well….whatever, I’m confused. Apart from those confusions, Little Dorrit brings us the true portrait of social and economics of London in 19th century. From this book we came to know how the combination of careless investment and the corrupt government would do injustice to innocent people. Mr. Dorrit was imprisoned in Marshalsea after failing to pay his debt. He should have not stayed there for such a long time if the Circumlocution had done their works. Moreover, families of the prisoner suffered much from humility and banished from the society. Even after being released from it, the imprisonment itself left a dark trace in one’s life, as had happened to Mr. Dorrit. In term of moral value, Little Dorrit taught us also that the real happiness does not come from wealth and status, but from love. Little Dorrit never looked at her poverty as a handicap; she always rich in love, and because of that, people loved her. Three and a half stars for Little Dorrit, it’s not one of my favorites, but still….how can you don’t love Dickens’ witty and sweet story telling? Although not the most influencing characters, Miss Wade is one of the most intriguing characters I found in Little Dorrit. She could not be included in the protagonists or antagonist group, as she was just an unhappy and indifferent young woman who added ‘colors’ to this book’s main story and theme. From her first appearance on board the ship that brought Arthur Clennam to England, I have noticed something special in Miss Wade. She was described as ‘a handsome young Englishwoman, travelling, quite alone, who had a proud observant face, and had either withdrawn herself from the rest or been avoided by the rest.’ She was a stern woman, anti-social and liked to spend times in her solitary; she seemed to be having a severe hatred in herself, and always regarded the world with bitterness. It was later on revealed that Miss Wade was an unfortunate human being. From her confession letter to Arthur Clennam, we began to understand why she appeared to be mysterious; and despite of her haughty manner, no one knew who she really was, and what social status or level she possessed. Miss Wade turned out to be born as an orphan. Since childhood she was treated differently; girls of her age with whom she lived with began to patronize her; and people conciliated her in insolent pity and superiority—just because she was an orphan. Miss Wade has a deep love towards another girl whom she lived with; but she treated her just like others. Sometimes she seemed to be sweet to her, but other times she often deliberately hurt her too by making her jealous. In a little coincident, Miss Wade heard her friend told someone that Miss Wade was a child with an ‘unhappy temper’. Further more when she was a young woman, she fell in love with a young man. They have been engaged and were certain to get married, when Miss Wade felt that the guy’s family wanted her to be submissive to the family. Once again Miss Wade felt she was being dominated by others, and this enraged her. The marriage was cancelled, and Miss Wade had a bitter hatred towards her lover. I think her strong will and determination came first from the lack of love she experienced in her childhood. Not having parental affection, she searched for it in her friends—and that’s why when she liked one of the girls, she loved her immensely. However she was disappointed by others’ superiority towards her, including her dear friend. It was the disappointment from her best friend which terribly hurt her. And unfortunately she lived among the society who highly praised social status at that time, that she was assumed and treated as a woman of lower class, despite of her educated and cultured manner. From her story, I learned that before we judge others, we ought to find out their background first, it’s more often than not, one’s character or moral was cultivated from his/her childhood social culture and education. If to reach my target in 2017 I should read at least two classics each month, then the above twelve I finished in five month was a fairly good achievement so far. From those twelve, I read three books for my The Well-Educated Mind self-project (The Scarlet Letter, Heart of Darkness, The Portrait of A Lady), which I’m enjoying so far. Working on this project has been extending my knowledge of each classics piece I read, and how I supposed to read it. Especially with tough pieces like those three I read, you’d need to delve deeper into it to get what the author wanted to say through the books. My biggest struggle was perhaps with Gone With the Wind. Heart of Darkness was also a struggle, that I must consult sparknotes and doing tasks from WEM first to finally grab the meaning. Another one I still failed to finish was Notes from Underground, which I would try to re-read from the beginning sometime this year. My most favorite was Great Expectations. Beloved was a great book too, but it was more striking than enjoyable. It’s a kind of book you would read once in your life, but the effect goes with you eternally. How about you, how’s your progress so far? While working on my WEM (The Well-Educated Mind) self project, I just realized that taking notes is one important aspect of reading—especially—classics. Susan Wise Bauer recommends us to always jot down our thoughts, questions, summaries, and quotes along the reading, that I must created a method to make everything easy for me. Between work and other activities, I can read anytime, anywhere, during the day—on the way to and fro the work, at work (thank God I stay behind my desk the whole day), at home, and anywhere else possible to read. 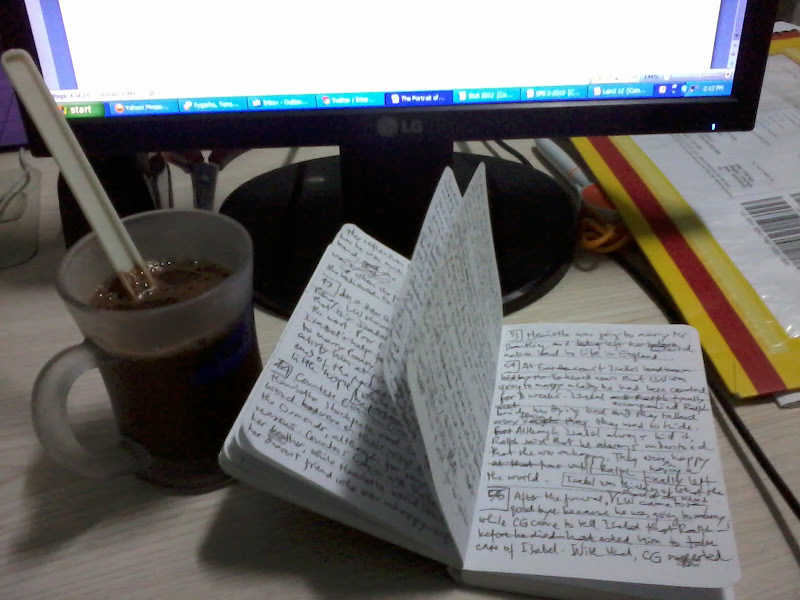 So, wherever I am, a book plus a light-small notebook always accompany me (when I am reading for WEM project). I choose light and small notebook because it’s quite handy and practical for me to carry. But what kind of notes, and how often I need to take notes to require such effort for creating a method? When I read a book with many characters, and read it from e-book, I would need to make a list of characters before I start reading. I don’t like to have to move to the earlier page and come back again to the page I’m reading everytime I need to refresh of some characters. 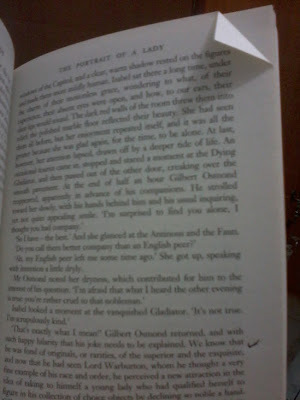 With paperback I have no such problem, as I can open the character page easily—provided that the book has it, or otherwise, I’ll add in any characters I encounter during the reading in my notebook. 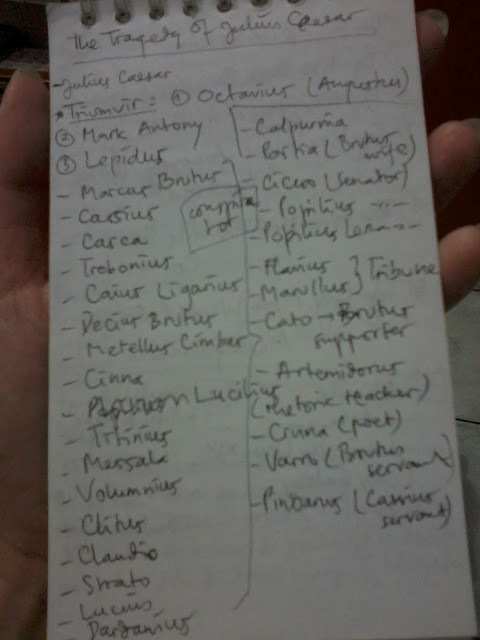 Here is just an example of my character list I wrote for Shakespeare’s Julius Caesar. 1. The most important event(s) in that chapter. …everytime I finished with a chapter. And this requires much of notes taking (and plenty of pages in the notebook) for each book I tackle for WEM! My notes for chapter summaries look like this…. 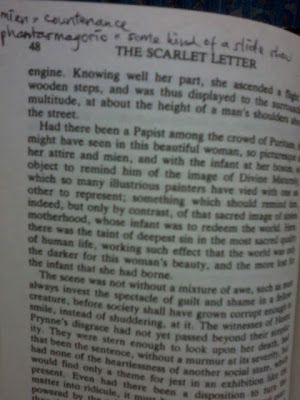 The first book I read for WEM project was The Scarlet Letter. At that time I was still searching the most applicable method to take my notes. 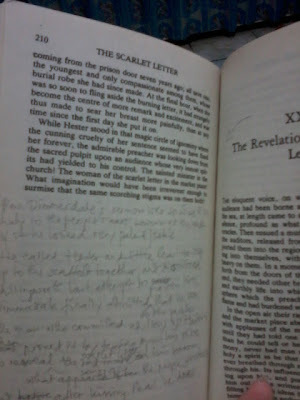 I tried to do it in the book; my copy of The Scarlet Letter is now full of summaries notes and vocabularies (words I’m not familiar with), just like these…. But after finishing the book, I felt guilty for having been scribbling on its pages, that I decided to not using that method anymore, and applied the light and small notebook system instead, which works and satisfies me so far. When I came to beautiful quotes or important passages I'd like to copy for my posts, I usually dog-ear the page (just a small part of the page which I would straight again after I've done copying—it won't destroy the book after it is placed on the shelf), and leave a check-mark near the passage I want to quote (so I don't have to look for it later). Why must I do that instead of copying it directly? Because I don't know whether I, in the end, will use that certain quote or not. Do you have any particular notes-taking method for classics reading? Check these WEM-ers methods too, you might find a particular method of taking notes that suits you well! (I will link to the posts after they have been published). Are you eager to make your acquaintance with Monsieur Zola? 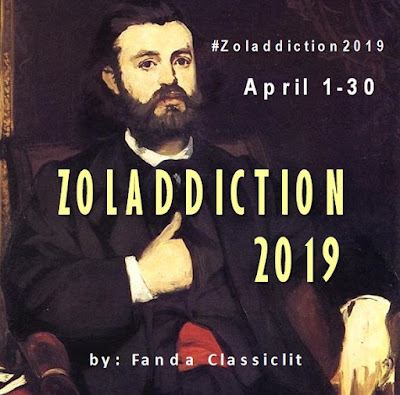 You can do it by participating at Zoladdiction, a Zola Reading Event in April. Signing up is already opened! And for you who had participated or are thinking of participating, what would you read for Zoladdiction? …because o and me have been addicted to Zola, now we want to spread the Zoladdiction to you all! 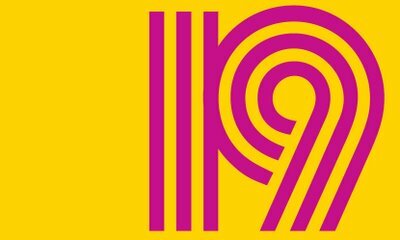 Notes: The levels were named after three of most popular female characters in Zola books. Maheude is from Germinal, Gervaise is from L’Assommoir, Nana is from Nana. Posting about your intention to participate in this event, including the level you choose (you can upgrade it later if you want), and books you are going to pick, if you already have the idea. Put links of that post in the linky below. Help us to spread the Zoladdiction, either by putting the Zoladdiction button on your sidebar, or by discussing the event on Twitter using hashtag #Zoladdiction. The master post would be up on April 1st with a linky where you can put your posts about Zola’s books. At the end of the event, o and I might prepare some questions to give you ideas to post your wrap-up (we still have to discuss about this). 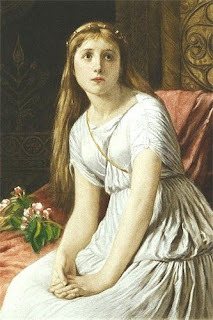 Cordelia is the youngest daughter of King Lear, and the kindest princess of the King’s three daughters. She is a tender-hearted young woman, honest and easily touched by injustice. Cordelia has no pretense in her. When King Lear asked his three daughters, how much they loved their father, Cordelia could not make up words to explain how deeply she loved her father, although she knew that her father would get angry to hear her plain expression. For Cordelia, it’s enough that she loved him deep in her heart; that her love could only be expressed through her care for him. Even if her answer would cost her everything—her inheritance and her suitors (she would have nothing as her dowry)—Cordelia kept her principle, that true love could not be expressed plainly through words. I think she could have invented some lovely words just to save her status in the Kingdom, but she did not do that. I admire Cordelia’s strong hold of her principle and honesty. And to those qualities, she was rewarded by the King of France—one of her suitors—by marrying her despite of the lack of dowry. Years after that, although having been unfairly banished by her father, Cordelia kept thinking of him, she never hated her father, there’s no vengeance in her heart. She persuaded her husband, the King of France to come to England to save her father from her two wicked sisters. When Cordelia finally met King Lear, he was not the powerful King any longer, he has been a poor and weak old man who was banished from his own Kingdom. In his condition, Cordelia still loved him, because she has been loved him from the beginning not as a King, but as a father. And now, when seeing the poor condition of King Lear, Cordelia could finally express her deep love for him. That’s the purest kind of love a father could expect from his children. And from Cordelia, we can learn that love doesn’t need proof; love can only be felt with our hearts. 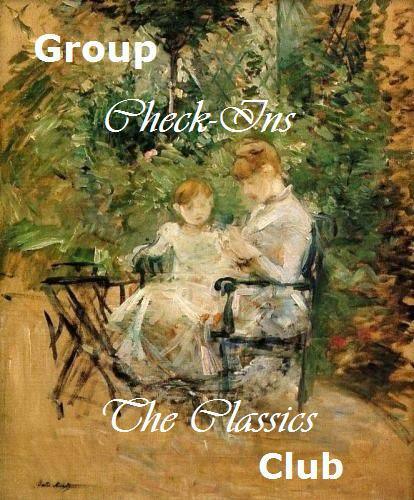 This is why I am proud as well as happy to be a member of The Classics Club; we are always provided fun events to read classics—which were often considered as serious readings. 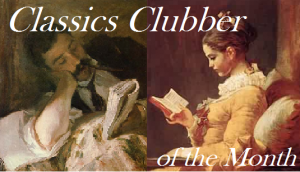 This time the club invited us in a challenge called The Classics Spin; the idea is to list 20 books from our The Classics Club list. 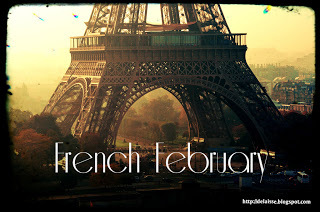 Then on Monday (Feb 18th) the moderator will “spin” those twenty numbers, and pick one number. Our next task is to read one book from the list which corresponds to the picked number. Isn’t that a good idea? First of all, I’d like to thank all of you who had been participating in #MeAndDickens meme by posting your “present” for Dickens on his birthday. Actually, I did not expect too much from this meme, as I know that some efforts would be needed to produce something unique—and there not many of us who have time and interest for it. It turned out, however, that this meme have interested not less than nine of Celebrating Dickens participants, and they all have produced equally unique and creative posts, that made me think hard before choosing a winner! It’s so hard for me to pick one of them, because I love them all, each in different way. But, I must pick only one winner, so….trying to ‘borrow’ Dickens’ way of thinking (if that is ever possible! ), I announce here the winner of Me and Dickens meme IS…. While Dickens would have been very pleased to read all the ten posts—mine included.. :)—I believe he would particularly be intrigued by Melisa’s message to him, in addition to her word-crafting, of course. What made Dickens’ books famous until now is—one of them—his unique characters; not only unique in personalities, but also unique in names (Plornish, Micawber, Dorrit, Havisham, ….you name it!). And Melisa expressed her admiration to that quality of Dickens in her message, which I believe, would be agreeable to the author! Not mentioning Melisa’s rather witty style in writing it, just as how Dickens is always famous of. Congratulations to Melisa, you can choose any book from Penguin English Library as your reward. Don’t forget to let me know which book you’d choose. And for the rest of you, thanks again for your efforts, it might not be your lucky day yet, but don’t worry, there will be another giveaway at the end of Celebrating Dickens! 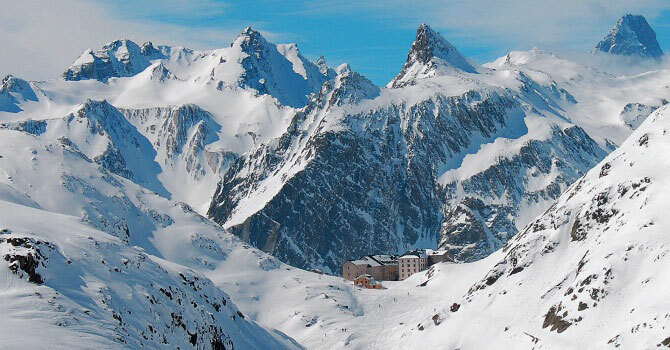 Starting the second part of Little Dorrit, Dickens brought us mountain-biking to the Alps of Switzerland. The “Fellow-Travelers”—as the first chapter title—stopped by the famous Great St. Bernard Monastery and Hospice. And to help myself following the vivid descriptions presented by Dickens (he actually visited the place on September 1846), I have gathered these…. enjoy! While this quote I picked from Dickens’ Little Dorrit might not have any greater values, it was such a beautifully written piece that I can’t just leave unquoted. This narration followed a poor gentleman in this story, who had been unlucky in his love adventure. 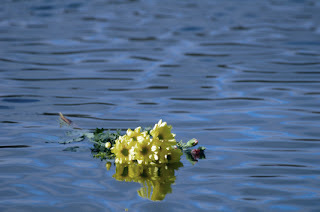 Well I think it’s not just about lovers, everytime we lost something dear to our hearts (it could be a friendship, a big opportunity, or anything we value the most in life), the above metaphor of the roses flowed from us to the eternal seas could describe perfectly our feelings, don’t you think so? "We might have gone about half a mile and my pocket handkerchief was quite wet through, when looking out, to my amazement, I saw Pegotty burst from a hedge. She jumped up into the carriage. Not a single word did she speak…. I noticed one of her button rolling around on the floor. I picked it up and treasured it as a keepsake for a long time." I still did not recognize what it was until the second scene where he (again) was listening to the same kind of reading. And this time I caught a specific word: “Mr. Micawber”. And there it was, no doubt that it was Dickens’ David Copperfield readings that he was listening to. Wow…I always found it amazing when a book or a movie discussed about a book or an author that I like to read. I mean, like Matt Damon..oh..I mean the character he played :), I am a fan of Dickens too, though I can’t say “huge fan”, because I don’t know whether I can listen to a reading of his book without falling asleep (the sound was soothing indeed!). And what did Matt D (let me use that name, OK? I love the name, and I forgot the character’s name anyway…) say to her about Dickens? “You know, people go on and on about Shakespeare, and it’s great, of course, but Dickens….” (he did not continue, but I know what he meant, I feel the same way too—Dickens is something special, although it’s difficult to explain the reason just in one sentence, you gotta read his books and find it by yourself). Still more….there was a scene where Matt D went to a house, and I soon realized that it was Dickens museum—the 48 Doughty Street museum where Dickens lived with Catherine and their children! Matt D has joined a city tour, and together with him I felt like I went there myself. The house was surprisingly quite smaller than I thought. I don’t know how twelve people can live together under that roof? The tour guide brought us to see Dickens’ first copy of A Christmas Carol and The Mystery of Edwin Drood, and his working room, his desk and the famous painting, Dickens’ Dream. If you could only see Matt D’s face, he seemed to be at his own home, where people he loved used to stay there, he touched the desk, the painting, as if he could remember every happy and sorrow memories in the past radiating from the materials. One of my favorite authors is Charles Dickens. My first Dickens’ encounter was on April 2011 when I read Oliver Twist. I know not whether it’s being a translation (to Bahasa Indonesia) or the story itself, that the book didn’t amazed me as I have expected. Eight months after that I read A Christmas Carol, and this time I think I began to admire Mr. Dickens for his writing style. Then 2012 came as the bicentennial of Dickens; and together with Melisa, I hosted a Dickens event for Indonesian Classics Reading Community (Baca Klasik) during February. I read A Tale of Two Cities for that event, and my liking of Mr. Dickens had been growing a lot since that, that I decided that Dickens has become one of my favorite classics authors. On that month also I ordered my copy of Charles Dickens: The Dickens Bicentenary 1812-2012. That book then inspired me to dedicate a separate blog for Dickens’ life and works, containing facts from the book and other sources, my reviews of Dickens’ books, and my analysis of Dickens’ book characters. I created All About Dickens on April 2012, and invited Melisa to co-manage it. It’s still far from perfect and complete, as it serves as a diary in my journey with my dear Mr. Dickens. After that I am officially a Dickensian. Last year I had savored Sketches by Boz, The Old Curiosity and Great Expectations, and became more in more in love with Mr. Dickens. :) His writing style is unique, as Matt D tried—but failed—to explain to the girl; it’s difficult to explain, other than I just love Dickens because he is Dickens; I love him because his writings are always enjoyable; it’s like reading tales when I’m a child, but with much more deeper meaning and reflection. Dickens can sometimes be witty and cynical, but at other times he can be emotionally touching. Not so impressive collection, but I keep working on it….